You’re preparing for a new puppy, and though it may not be one of the more exciting things on your new puppy checklist, you’re likely wondering what type and size of collar to get for your new fur bundle. Maybe you’ve already stood in wonderment (and confusion?) in the dog collar aisle of your local pet supply store? With so many different types of dog collars on the market, it can be difficult to know which kind is best for your new puppy. A standard neck collar works well to display your puppy’s identification and contact information should they become lost, but is it the best option when taking your puppy for a walk? From collars to harnesses, we’ll review the various options so that your puppy is best equipped for leash walking. You may be surprised to learn that a standard flat neck collar may cause more harm than good in many situations. A quick jerk on the leash, especially with a running start, can cause injury to your dog’s neck and your shoulder. Taking a walk with the leash attached to a neck collar can also worsen existing health problems. Canine Wobbler Syndrome — a neurological problem affecting the spine in the neck region, typically of larger breed dogs. “Wobblers” manifests as an abnormal walking pattern. If “Wobblers” is suspected or diagnosed, a neck collar should definitely be avoided. (More about Wobbler Syndrome from our friends at The Ohio State University College of Veterinary Medicine). The following list will review the various harness and collar options that you can use when walking your dog on a leash. Standard flat neck collar: This is the type of collar you’ll find in most pet stores and is commonly made of nylon or leather. 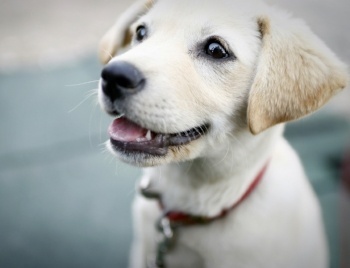 A breakaway collar is recommended for young puppies while they are unsupervised, and also on adult dogs that are very “mouthy” when they play with other dogs, since they all face the risk of their collar getting caught and potentially choking them. Martingale collar: Similar to the flat neck collar, this collar contains an extra loop of material that allows the collar to tighten when the dog pulls on the leash, but not so much that it would cause choking (so long as it’s sized correctly). Martingale collars are common for greyhounds and whippets whose heads are smaller than their necks as it helps to prevent them from slipping out of their collar. No-pull head collar: The head halter can be compared to a horse bridle. It’s not a muzzle and the dog can still sniff and open their mouth, but because the leash attaches to the dog’s head, it works as a deterrent to leash pulling and also allows the owner to keep the dog from picking up trash and other no-no’s off the street. Head collars are humane and can be extremely effective at decreasing leash pulling when trained right. Many dogs adapt to head halters quite readily, though some may take a little longer to get used to wearing one. Head collars are not appropriate for dogs with neck injuries or abnormalities, and they may cause discomfort in dogs with dental disease. Make sure to pick the appropriate size based on your dog's weight. Back-clip harness: This type of harness fits around the dog’s chest and the leash attachment is on their back. It works well for dogs with short snouts such as Pugs and Boston Terriers, small breeds, and dogs prone to tracheal collapse. The downside of these harnesses is that they can encourage leash pulling in dogs that aren’t loose-leash trained. No-pull harness–front clip: Also fitting around the dog’s chest, this type of harness has the leash attachment in the front of the chest. They are designed to help reduce leash pulling by redirecting the dog. The front clip harness can be a great tool for helping with control and loose-leash walking, while sparing a dog’s neck and throat. Prong collar: Designed with metal or plastic “prongs” that rest on the dog’s neck. These are aversive type collars that depend on the pressure and pain they inflict to the dog when the dog pulls on their leash — see our cautionary note below. 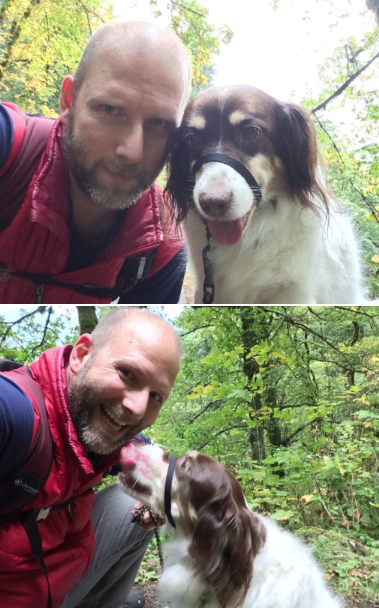 Choke chain: These (typically) metal chains fit loosely around the dog’s neck but will tighten when the leash is pulled, causing it to choke and constrict around the dog’s neck. Like prong collars, choke chains depend on the pressure and discomfort they inflict to the dog when the dog pulls on their leash — see our cautionary note below. Please note: We, and many other pet health, training, and safety organizations, strongly advise against using prong collars and choke chains. They are painful and unnecessary tools that “teach” using negative reinforcement and positive punishment— an undesirable combination that can undermine your relationship with your dog, as well as your training goals. (See this position statement on the use of these aversive tools from The Pet Professional Guild.) They can also cause neck injuries and breathing problems, as well as multiple types of “training fallout” (including the exact opposite behavior of what you are trying to teach your dog). For your puppy’s sake, and for yours, just don’t go there. Now that you’re aware of your options, the type of collar you choose for your puppy will depend on their breed, age, and their energy level/how much they pull on the leash. If you’re still working on loose-leash walking, your best bet will be a harness or head collar. When in doubt about the best option for your dog based on their breed and medical condition, always speak with your veterinarian. If it’s a behavioral/training problem you’re looking to fix, speak with your veterinarian, a board-certified veterinary behaviorist, and/or a certified dog trainer. For behavioral & training help, including resources to help you find a behaviorist or trainer, please visit our Training and Behavior Resource page. While you’re finding that perfect neck collar for your dog, be sure to choose a collar with a width and hardware that is appropriate to your puppy’s size. A flat collar should fit snug around your puppy’s neck with enough room to fit two fingers between the collar and your puppy’s neck. This flat collar is adjustable and comes in different sizes. You can also use a tape measure to measure your dog’s neck and then add 2-3 inches. Growing puppies should be measured frequently for readjustment. Now that you’re equipped with everything you need to know about dog collars, you can properly pick out the best option for your new puppy or reevaluate what you are using for your current dog. For behavioral & training help, including resources to help you find a behaviorist or trainer, please visit our Training and Behavior Resource page. 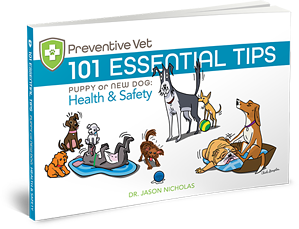 If you have found this information helpful, check out our new book, 101 Essential Tips: Puppy or New Dog - Health and Safety for more handy information.